Having a bad hair day? Never fear, a trusty square scarf can hide your hair-related woes. Who needs to spend hours in front of the mirror when you can hide your bedhead and style it up like Rosie the Riveter. You can do it! It’s really easy and requires no sewing at all. 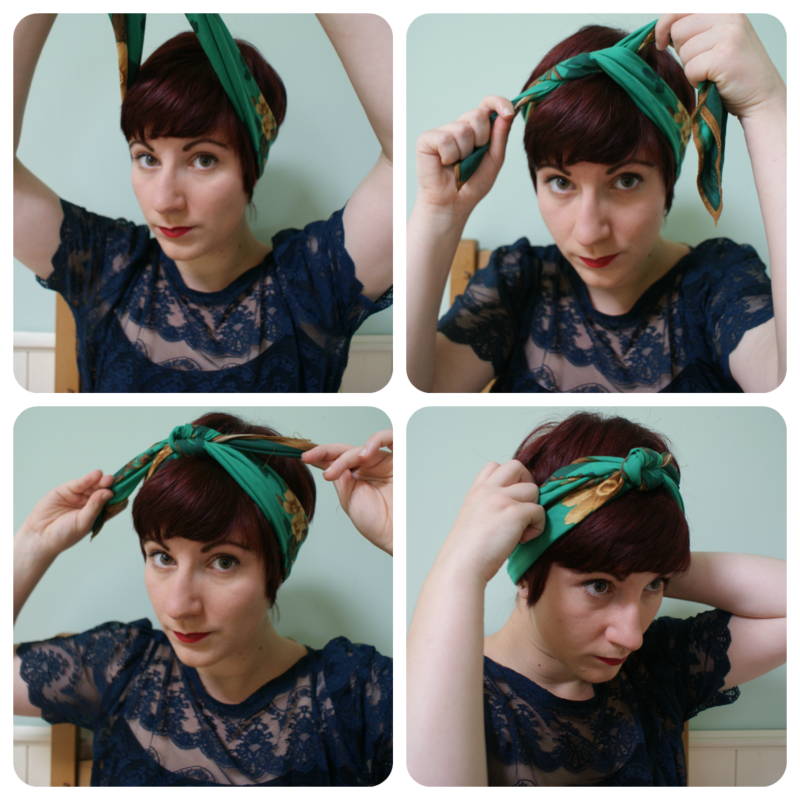 Anyone who’s grown their hair out from a pixie haircut knows what a nightmare it can be and headscarves are a handy way to dress up your hair when it’s in that awkward in-between stage where you’re THAT CLOSE to just cutting it all off again. Equally, it’s useful for hiding away longer hair if you don’t feel like doing too much with it. All you need is one square-shaped scarf, some hair pins and possible some hairspray. Scarves which aren’t silky are far easier to work with, but an army of pins can usually help out with the more slippery suspects. First things first, fold your scarf into a triangle shape. Depending on the length of your hair, you can pin or tie it up. I tend to pin up the back of my hair and then hairspray it in place so it won’t poke out of the bottom of the scarf. Those of you with longer locks may want to tie your hair in a smallish bun. Lay your scarf on your shoulders as though it were a shawl and pick up two of the ends. The triangle’s point should be facing towards your shoulders. Tie the two ends together on the top of your head. Bring the point of the triangle to the top of your head and place on top of your first tie. Then grab the longer parts of the scarf once more and knot over the point so it’s secured. Then it’s time to get tucking! Tuck in the bits sticking out along with the ends of the scarf until everything’s concealed. Some scarves are long enough so you can tie the long ends around the back of your head. This is normally when I turn to my army of hair pins, or however many soldiers I have left standing because, much like my fabric pins, I seem to lose them quite easily. The best places to pin to secure the scarf are by your temples as shown and also by the nape of your neck. If I don’t pin, I find the scarf slips quite a lot during the day. Et voila! Strike a pose and you’re done. You can be a bit more creative with the ends if you want to be, creating a little bow for example or just leave the ends out if your scarf is quite small. Personally, I prefer it to be as clean as possible because all of my scarves are made from quite busy fabric. You can also tie it up like a headband. For this, you need to fold your scarf from the tip of the triangle until it’s a long rectangular piece. 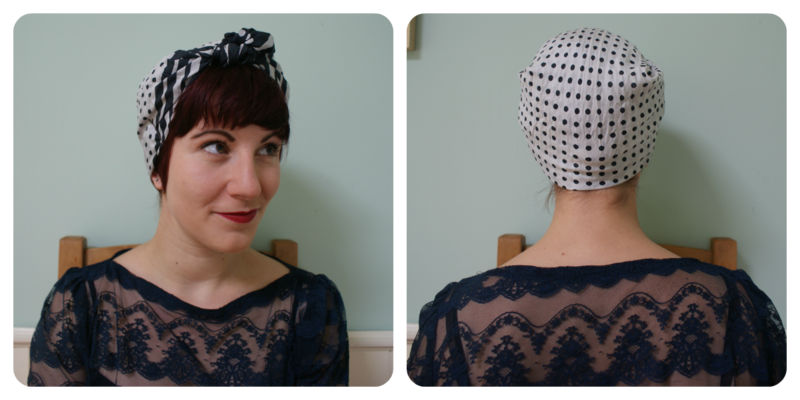 Then, just tie around your head twice and tuck in the ends and pin in place as before. Not bad eh? I own far too many scarves than is sensible so this means I get decent use out of them. While I worked at Lush, most of the girls would end up wearing scarves in their hair because our manager pulled them off so perfectly and she very kindly taught us how to knot it up retro-style. 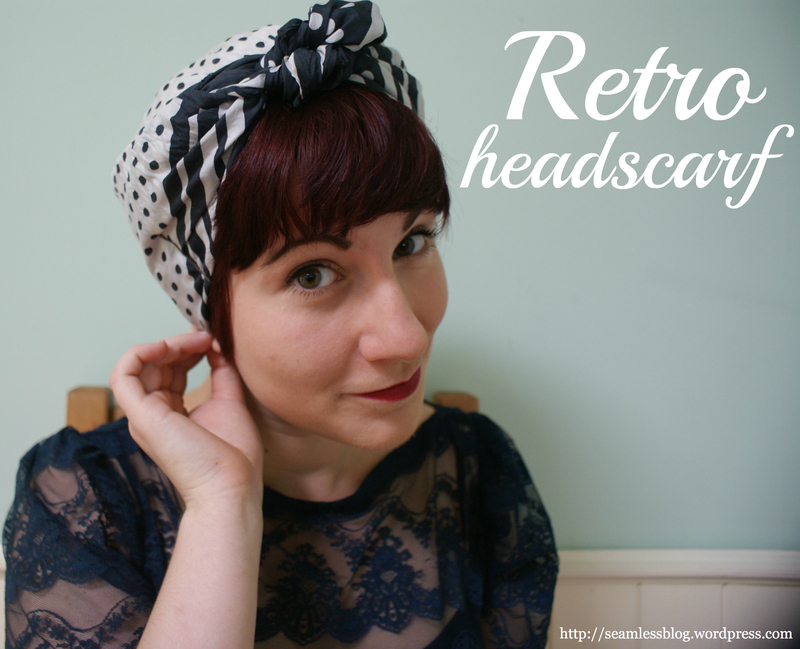 If you’re on the hunt for some vintage headscarves, most second-hand shops have a decent stock of them. In fact, those sold in Lush are all either vintage or recycled from plastic bottles – good news for those of you taking the Seamless pledge! 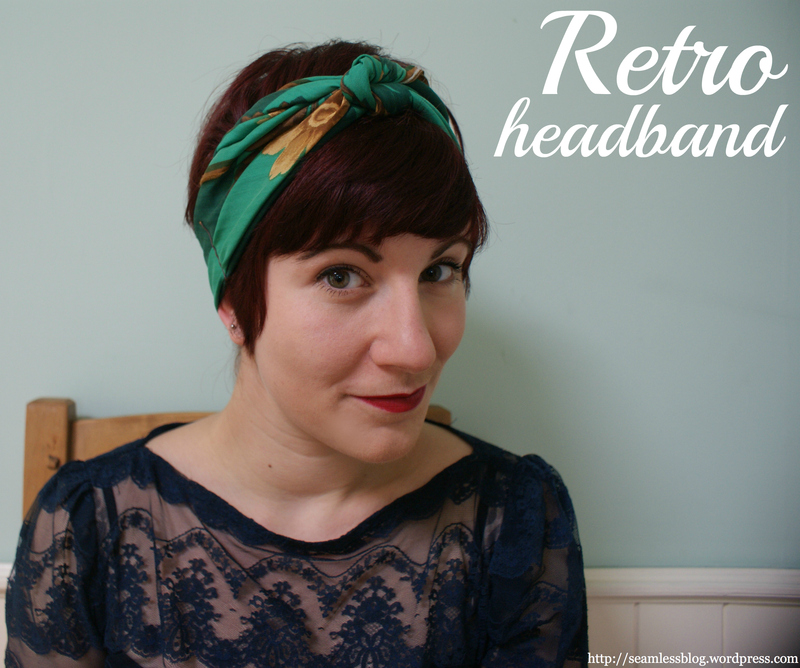 If you have a go, do send me some of your headscarf pics, I’d love to see them. So cute! I’ll try it. thank you for this! I am going camping soon and this look will come in v handy im sure! Not a problem, I hope it helped out 😀 – re your question on an earlier comment about making it stay, I find an army of pins to be key! Bit awkward when I was doing this tutorial, I’ve lost all but four of mine! Argh! sometimes the back of my head is not my friend- so I’m a big scarf devotee. Thanks for some new ideas! Thank you for the tutorial. I have decided to grow my hair again and this will be a great disguise for that horrid ‘in between stage’! No problem! That’s actually exactly why I started wearing them, to cover up the mullet stage haha. Reblogged this on The Indifferent Stylists. Love this! 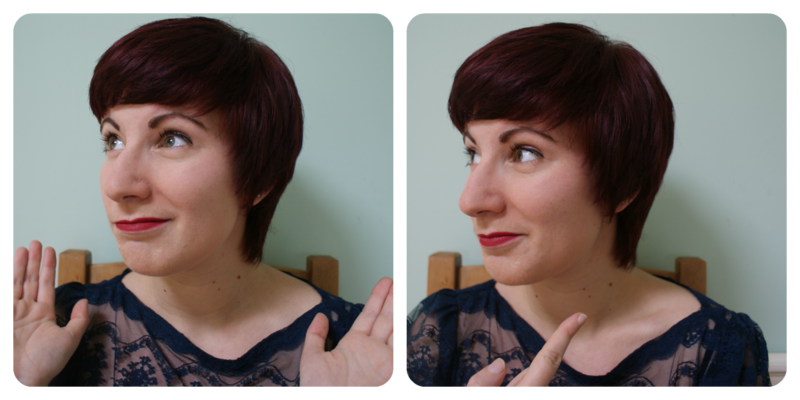 I’m currently sporting a bit of a mullet while I grow out my pixie for my wedding. Definitely trying this today! So cute! I’ve finally just discovered the amazing-ness of scarves and can’t wait to wear them this summer. Totally off-subject: I lovvvvvvve your hair color! If you do it yourself, would you mind divulging what dye and shade you use? Thank you so much! Oh god so sorry I hadn’t seen this at all! 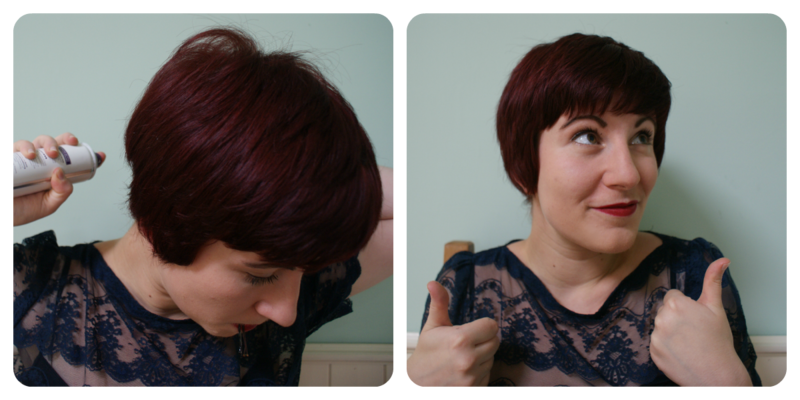 I don’t have red hair anymore, but I used to use Garnier Olia Intense Red I think?